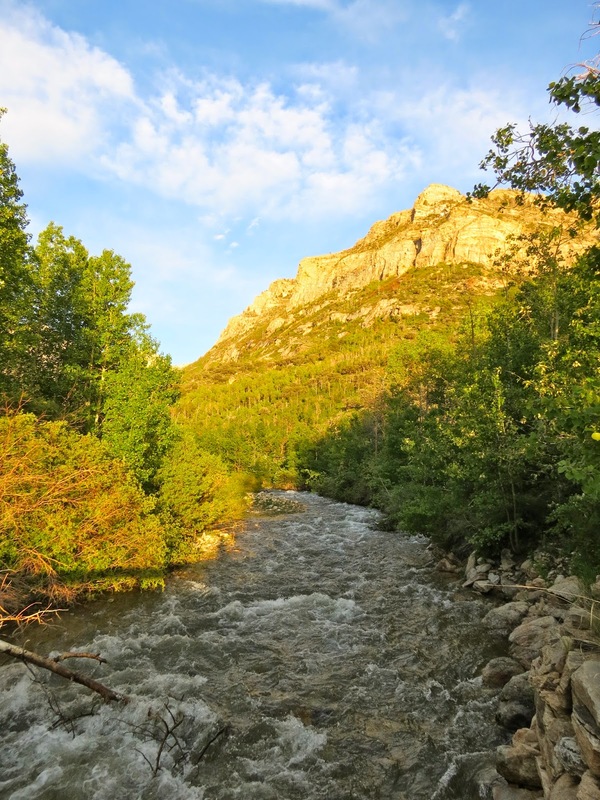 The drive up Lamoille Canyon to Thomas Canyon Campground was beautiful. RVing friend Patty happens to be the camp host at the campground. This was the first time I have met Patty in person, and once more it was affirmed that fellow RVers are the best kind of people. Left to right: Me, Thistle, Birdie, Patty. View from the campground, looking up Thomas Canyon. The snow-covered peak in the center is Mt. Fitzgerald. Patty tells me it was named for John Kennedy's mother. My site at the campground. Mountain sheep and goats can sometimes be seen on the rocky cliffs, but we didn't see any while we were here. Thistle posing in the wildflowers. Which were abundant in and around the campground. 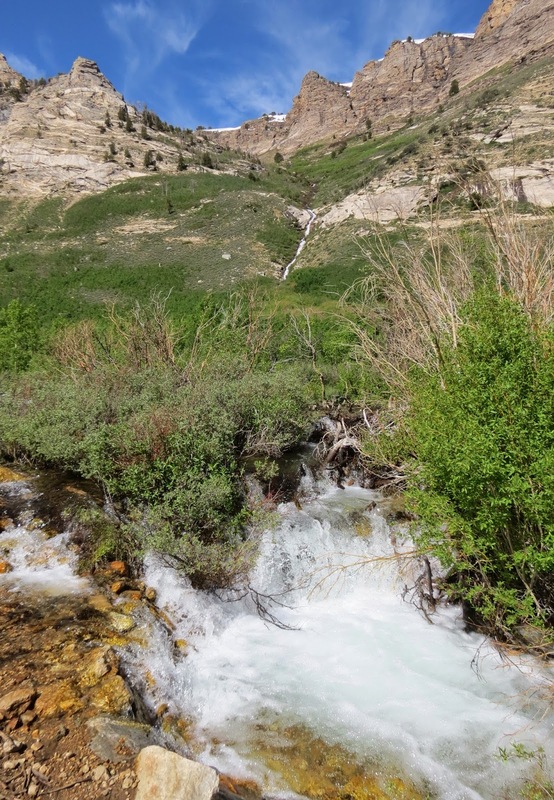 Lamoille Creek flows swiftly through the campground. Thistle had to drink some. These chokecherry bushes were in full bloom throughout the campground. There should be a bumper crop of chokecherries this year. Tent campers next to the creek. You'll have to imagine the constant roar of the water. 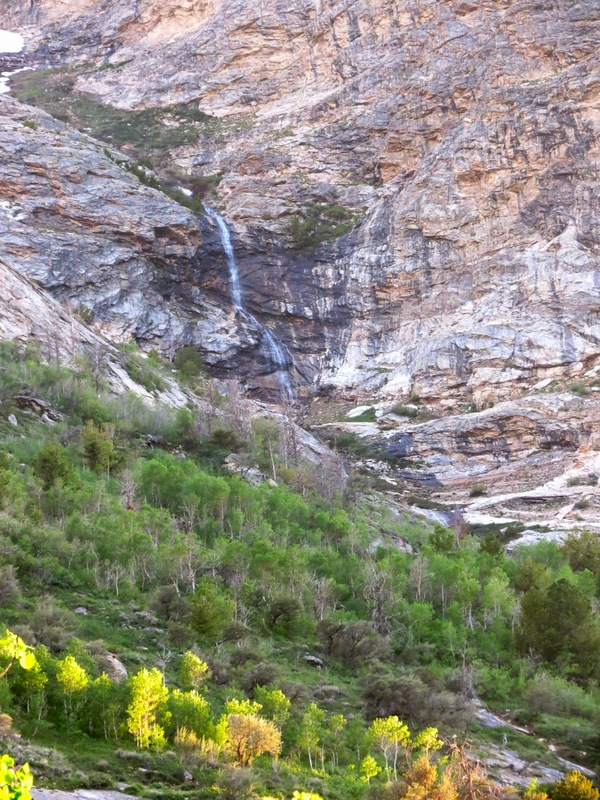 Melting snow creates many waterfalls in the canyon. 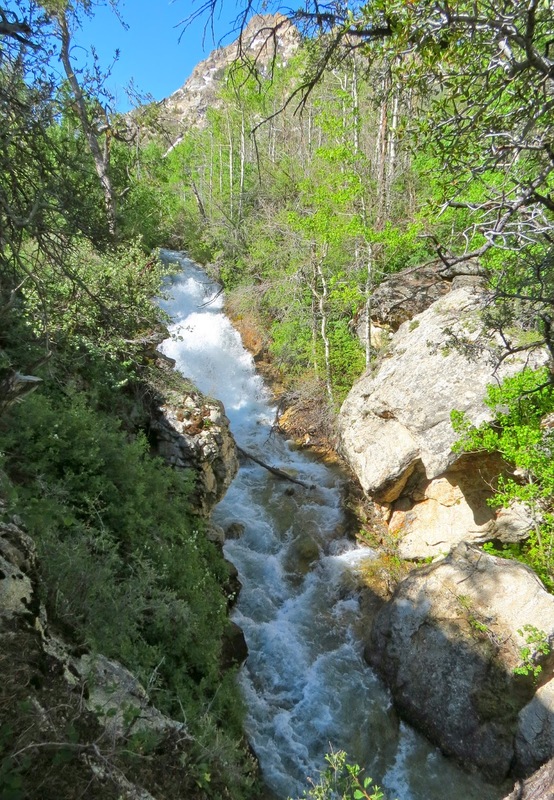 It looks like a narrow stream cascading down the mountain, but up close it is a roaring waterfall. Early morning sun on Mt. Fitzgerald. We were lucky to be here on Patty's 2 days off. She was able to come with us on a hike up Thomas Canyon. It starts off with some steep uphill. The trail follows alongside Thomas Creek. The views along the trail are outstanding. We met two others on the trail who took our picture: Patty, Birdie, me. Birdie spotted the Carolina Chickadee. Swift-flowing waters of Thomas Creek. This ground squirrel was too busy eating to be worried about me. Patty told us about a large beaver dam that broke last year, flooding some of the campsites. The gray line on the right of the creek is the remains of the old dam. The dam and beaver pond had been there for more than 25 years when it broke. You can see the area of the dam break in this picture. The dam and pond appear to have been abandoned by the beavers. There is another beaver pond downstream nearer the campground. Thomas Creek with a waterfall in the background that contributes to it. We stopped fo a snack and then returned to the campground. Great little hike! And we all made it back down! Patty is a great camp host. She makes it a point to get to know all the campers. Many of them return every year. When we got back to her site, Patty found this giant Thank-You card from a 4-H group that had been camping here. And I can say I have never been so warmly and personally welcomed to a campground before! 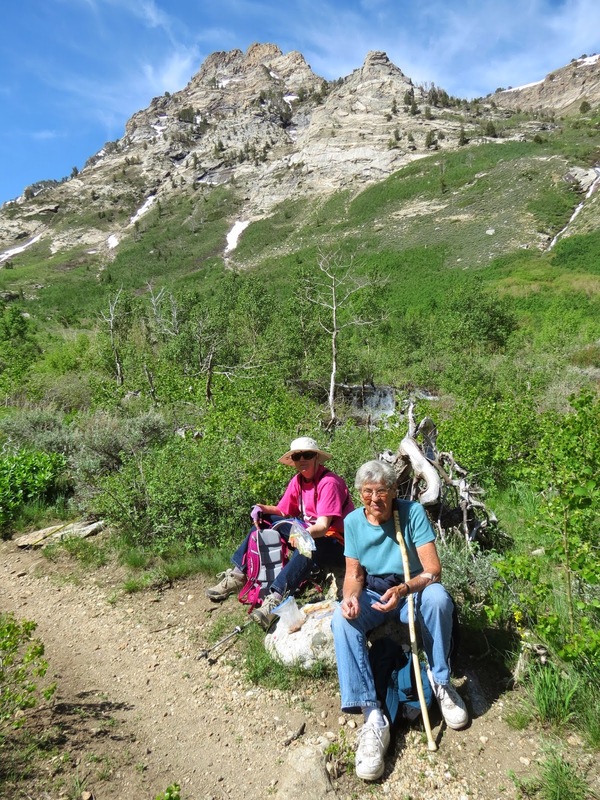 In the afternoon Birdie and I took a ride the rest of the way up Lamoille Canyon, which continues another 5 miles past the campground. We passed many more waterfalls. More beaver ponds along Lamoille Creek. There are interpretive displays at pull-outs along the way. Thistle tests the water again. It probably doesn't really compare, but it makes me think of the Swiss Alps. The road and picnic area up here are not officially open yet, but you can drive around the snowdrifts that still cover half the roadway. There are trailheads at the end of the road. One goes up to the Ruby Crest Trail which continues for 43 miles to Harrison Pass. The other goes 2 miles in the other direction to Island Lake. We decided to come back and hike that one. Views of the lower canyon. All this landscape was carved by the Lamoille Glacier. 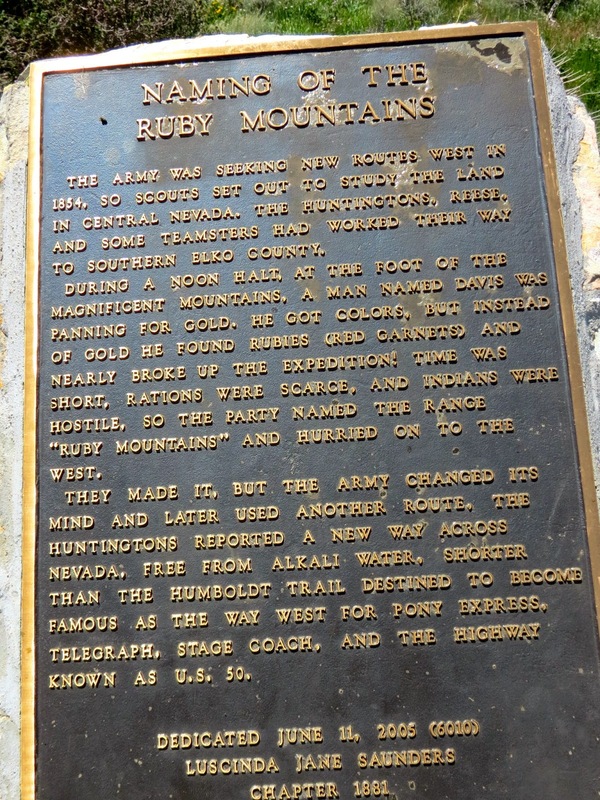 The Ruby Mountains got their name when Army scouts panning for gold found rubies (red garnets). The carpet of yellow flowers are called Arrowleaf Balsamroot. Map of the trails in the area. Many more to do. You can see the trail up Thomas Creek, and the next one we'll do to Island Lake. It was cold and windy when we started out. There is still quite a bit of snow on the trail. But you forget about the cold as you admire the scenery. It's really hard to believe this is Nevada. The trail climbs up several switchbacks. In addition to the hike, Birdie is in pursuit of the Himalayan Snowcock that lives up here. Island Lake is the source of this waterfall. We cross over on this bridge. Looks like the bridge is undergoing repairs. They probably have to rebuild it every year in the Spring. Not sure if this squirrel is pregnant or just fat. In many places water is flowing down the trail. Some rocky places in the trail. 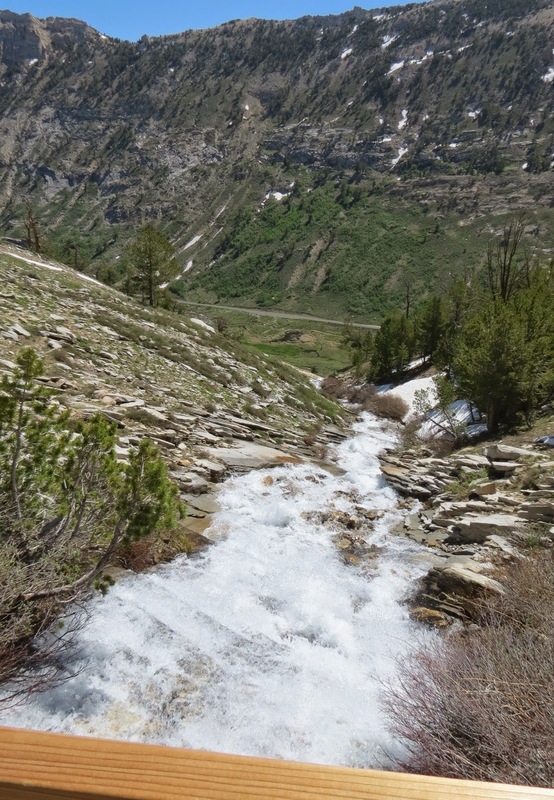 The white line of snow and ice on the left is the start of the waterfall...flowing underneath the snow. The lake is just over that ridge. The beginning of the waterfall, spewing out from underneath the icy snow. Lots of snow up here. We made it to the lake...still pretty much frozen over. We met this 70+ year-old gentleman hiking with his grandson. His outfit lent to the image of the Swiss Alps. There was a tent camper under the trees. I bet they were cold last night. We searched with our binoculars for the Himalayan Snowcock up there, but didn't see one. It's hard to see the small island in the middle of the lake with all the debris around it. View at the top. The elevation here is 9800 feet. One more view of the waterfall as it leaves the lake. Great hike. Next post will be from another part of the Ruby Mountain Wilderness, the Ruby Lake Wildlife Refuge in the valley.